When I was fortunate enough to speak to Ti West shortly before the release of 2011’s “The Innkeepers,” he described wanting to set out to make a ghost story that was “charming,” an adjective that isn’t normally the first to come to mind when describing West’s work, yet as has become one of the most accurate as the years have gone on. Capable of the most disturbing imagery imaginable (and often well beyond that plane), the writer/director has demonstrated he’s well aware that the dagger sinks in that much deeper when he’s so intent on inviting the audience to care. This charm offensive is deployed most immediately in his first western “In a Valley of Violence” in the form of Abby, a pooch with a handkerchief tied around his neck, the loyal confidante of Ethan Hawke’s gunslinger Paul, who has all but packed his six-shooter away after deserting the army. But the dog’s a pistol, able to maul potential threats to Paul and make conversation with his master with equal care, making the evenings Paul spends far from the wife he left behind along with the war, less lonely. Needless to say, this partnership is disrupted after Paul finds his way into Denton, a town entirely populated “by sinners” if a priest (Burn Gorman), running as far from the premises as possible, is to be believed, and runs afoul of Gilly (James Ransone), the dangerously dumb son of the marshal (John Travolta) who makes it his business to get revenge on Paul after embarrassing himself in the town square as a result of trying to show his authority. 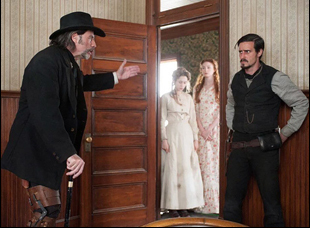 West doesn’t do much fancy with the plot, relying on the tried-and-true narrative of a violent antihero’s attempt to go on the straight-and-narrow – even without the dog, “John Wick” comes to mind, but he fully embraces the theatricality of the westerns that have come before, particularly the films made in the ’60s that broke free of the black-and-white heroes of the Eisenhower era to become the truly Wild West presented in Spaghetti westerns. An animated opening title sequence that would seem to split the difference between Iginio Lardani‘s work on Sergio Leone’s films and an LSD trip is a fitting introduction, with West celebrating what more serious-minded directors might run away from. Denton looks very much like a film set (then again, what frontier towns, built for temporary settlement, wouldn’t?) and the colloquialisms (as “useful as a fork in a sugar bowl,” exclaims Taissa Farmiga’s boisterous maiden who comes to Paul’s aid) are as bright and abundant as the desert sun. These touches make it so Don Knotts wouldn’t feel out of place in the proceedings, but having such toughened performers as Hawke, Travolta and Ransone on hand – all of whom, in addition to a game Farmiga and Karen Gillan, appear to be having a ball with playing both the silliness and grit – give “In a Valley of Violence” ample menace to smooth out the film’s idiosyncratic tone as it heads towards a bloody conclusion. The mix of humor and horror shouldn’t surprise those who have followed the director, but it’s exciting to see West work so hard to upend any expectations audiences may have of him. With “In a Valley of Violence,” he doesn’t only find opportunities to stretch himself in a different genre, experimenting with long lenses and Jeff Grace’s zesty yet majestic score, but often takes what’s familiar about his most well-known cast to date, whether it’s Travolta’s intense stare of Travolta or Hawke’s world-weariness, and wring something new and interesting from it. In a film where the pleasures can feel so enjoyably juvenile at times, it is yet another to see West continue to grow. “In a Valley of Violence” will be released on September 16th. It will play a second time at the Seattle Film Festival on May 29th at 3:30 pm at the Lincoln Square Cinemas and subsequently screen at the BAMCinemaFest in New York on June 18th.